This quick review is by Paul – the Tier Point Runner, TLFL’s newest team member. You can find out more about Paul here. Over to you Paul…. So my first post – best make it a good one! So quickly the details around this flight…. It was part of the following ticket…. Lisbon-London-New York-Los Angeles-Honolulu-Los Angeles-New York-London-Athens all in business class or First where possible. This gave me 1240 Tier points and about 45,000 Avios for £1898. This flight was chosen primarily to catch up with a friend in Heathrow T3 so was a good opportunity to test the AA First product. I have flown this domestically Los Angeles-Miami before but never on a Transatlantic service. Whilst all BA services from T5 to New York JFK have a First cabin, AA only has 2 First services a day on the 77W. This is just 16 seats. And on AA105 (this flight) we had 4 out of 8 seats. We had mixed expectations and arrived from Lisbon ready to hit the lounges. I will make one last point – I am NOT a wine connoisseur and the below is simply my opinion. There is a plethora of lounges to sample if you are flying on oneworld from Terminal 3. 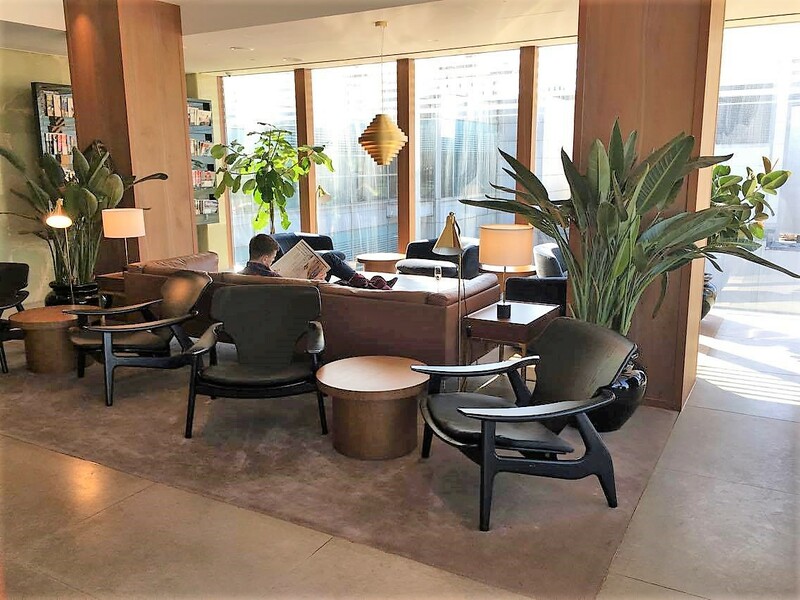 You can read about which is the best lounge here or read individual reviews of each lounge here. I visited the Cathay First lounge rather than the American Flagship First lounge in order to enjoy Cathay’s excellent food and drinks. 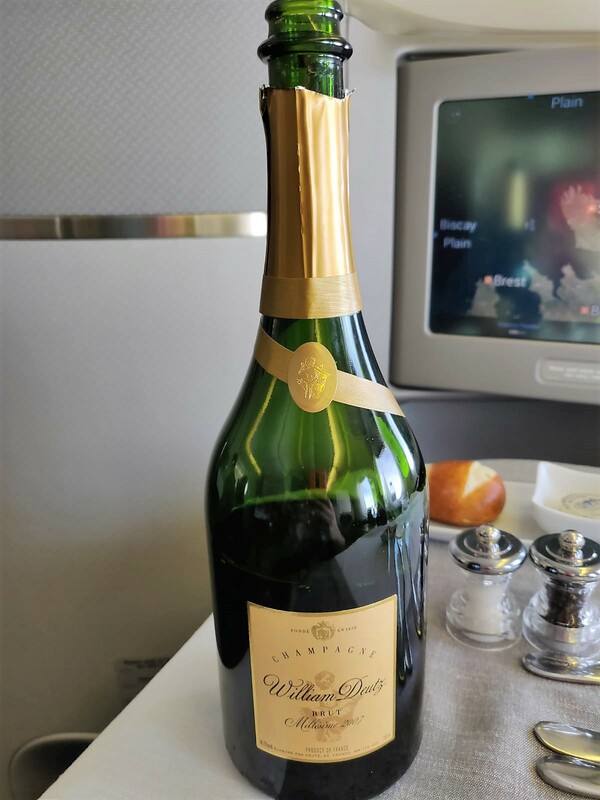 Cathay used to serve Baron Rothschild champagne but recently switched to Berry Bros and Rudd which is not quite as good. They also still have Moet as an alternative. God, I love the Dan Dan noodles though – sorts out any hangover! We also popped into the Qantas Lounge for a quick gin with Tony the bartender before heading to the gate. 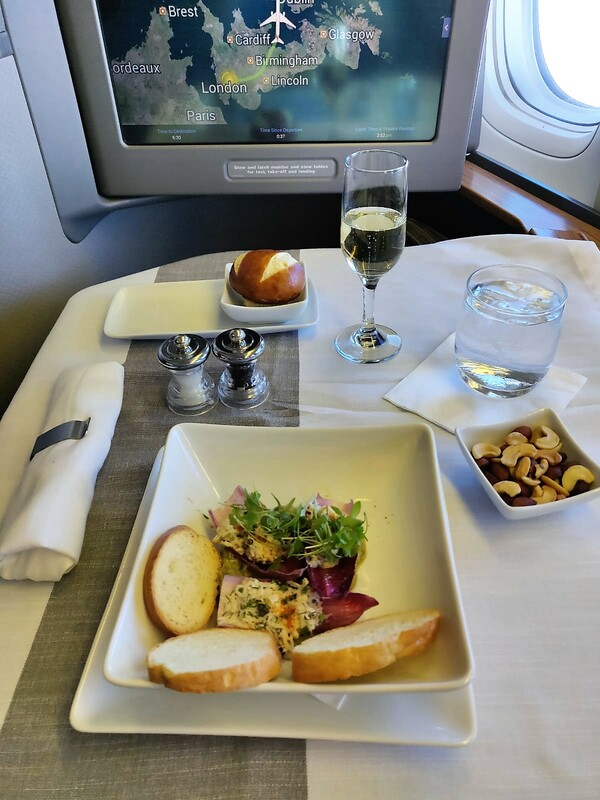 There are just 8 seats in the American Airlines B777-300ER cabin, which is the only aircraft type to offer international First Class. The seats are laid out in a 1-2-1 configuration. I had chosen seat 1J, a window seat. The seats have a width of 21.5″ and an unusual swivelling seat option. As I said earlier, my group were 4 of us, and we had all the window seats in the cabin. It also proved useful to compare the service on each side. At my seat were a bottle of water, a smart leather amenity kit, the menus and the standard American Airlines noise cancelling headphones in a proper case. 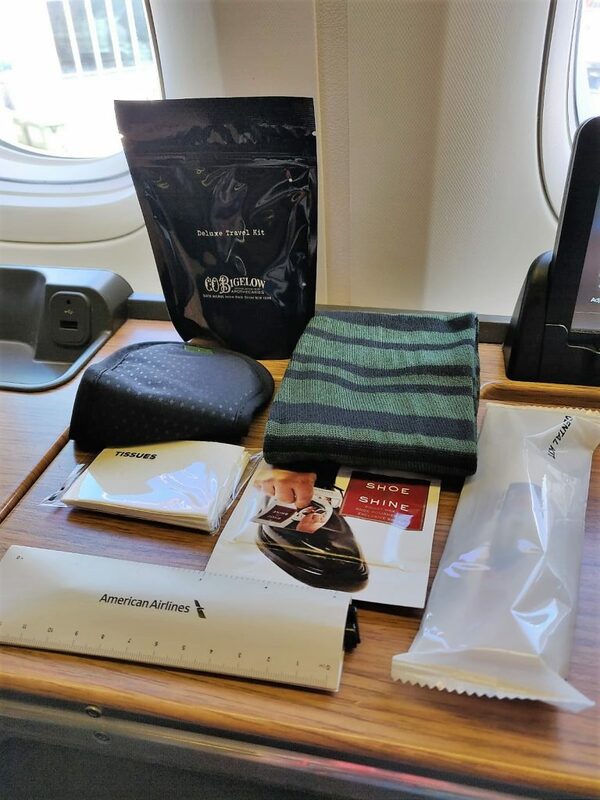 The amenity kit had the usual CO Bigelow toiletries as well as a dental kit, eyemask, tissues and some striped socks rather than the usual boring plain ones. There was even a shoe shine sachet. The offering was aligned well with BA so far – although I still hate the way BA give you headphones in cheap plastic! Well done AA. 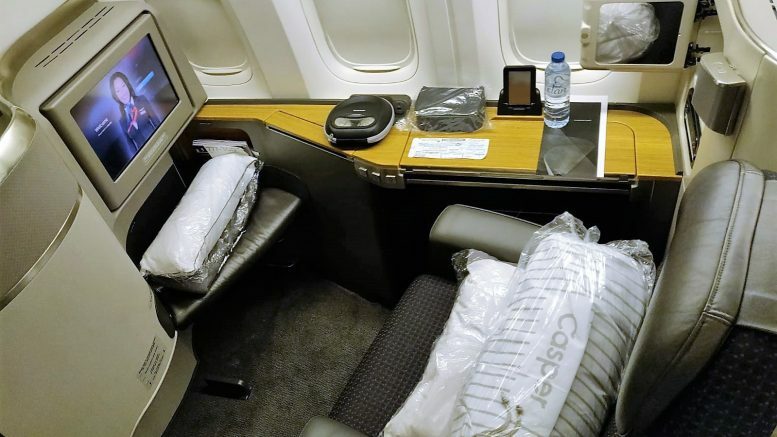 I found the seat very comfortable and definitely the best First Transatlantic on oneworld, with the only other offering Heathrow-JFK being BA which I have flown many times. The only major flaw was that it wasn’t very private being open to the side although it was enclosed at the back of the seat. 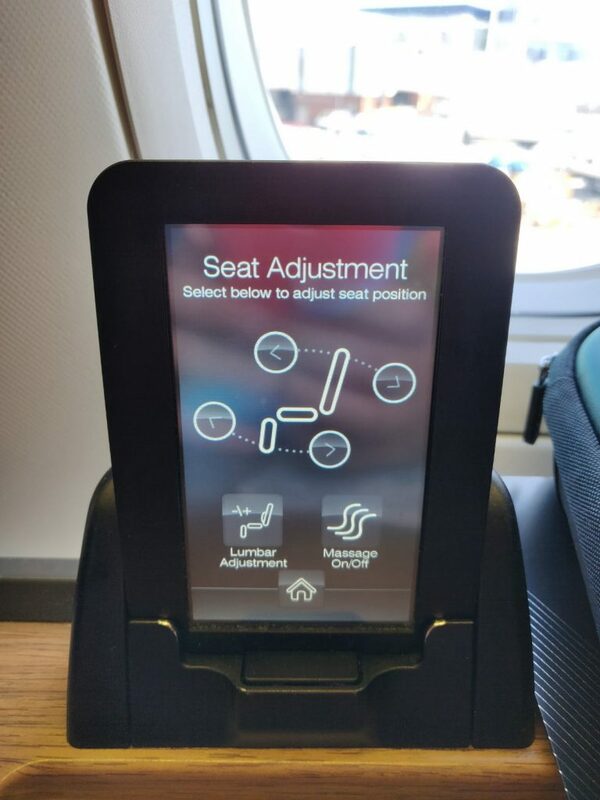 There were lots of options to control the seat which was done from an electronic iPad like display which was simple to use – I feel AA could have added more functionality to this display – call button etc which still live on an old style remote. But it works and looks smart so no real complaints. The seat had lots of options such as preset positions like the bed, a massage option and even an option for privacy so you wouldn’t be disturbed for anything. The crew….. well no complaints from me largely. You have to engage them to get the best, and regular eye contact helps your glass stay full! The J seats side of the cabin had a far more welcoming crew member from comments after the flight – and on the odd occasion the flight attendant from the A side came over I can see why! BA largely have this down to a fine art in my opinion be it WorldWide or Mixed Fleet. BA definitely still have this one. Although I had an amazing AA crew from LAX-HNL – might write about that one soon…. 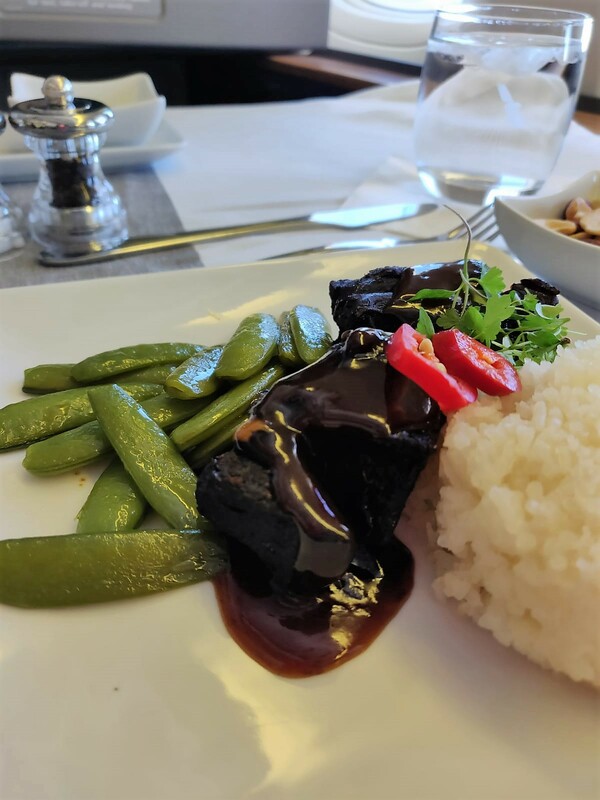 There was a full meal served at the start of the flight and then you could also have a small snack just before arrival if you wanted. I went for the crab and avocado salad to start. I was offered a selection of warm bread to accompany my meal and chose some pretzel bread which is often available on AA. 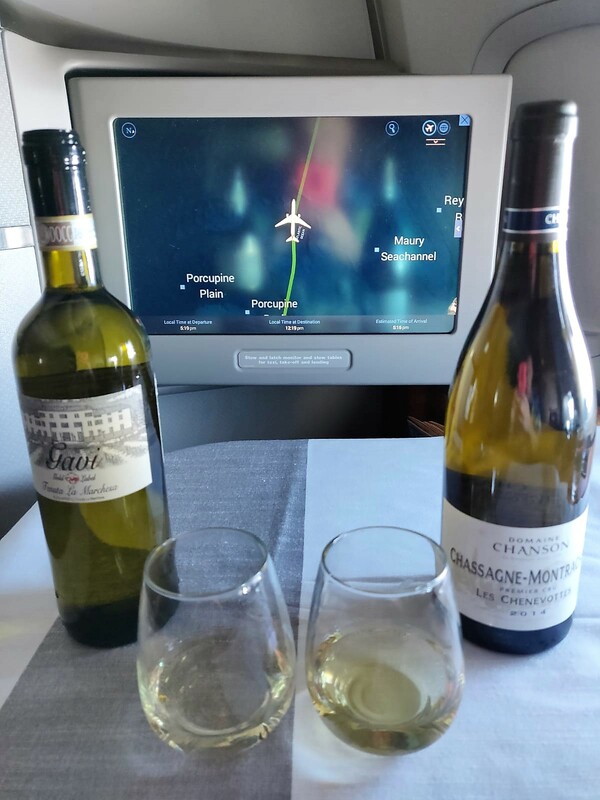 I must add looking at the below picture, AA still serve the pre departure beverage in plastic – even champagne. 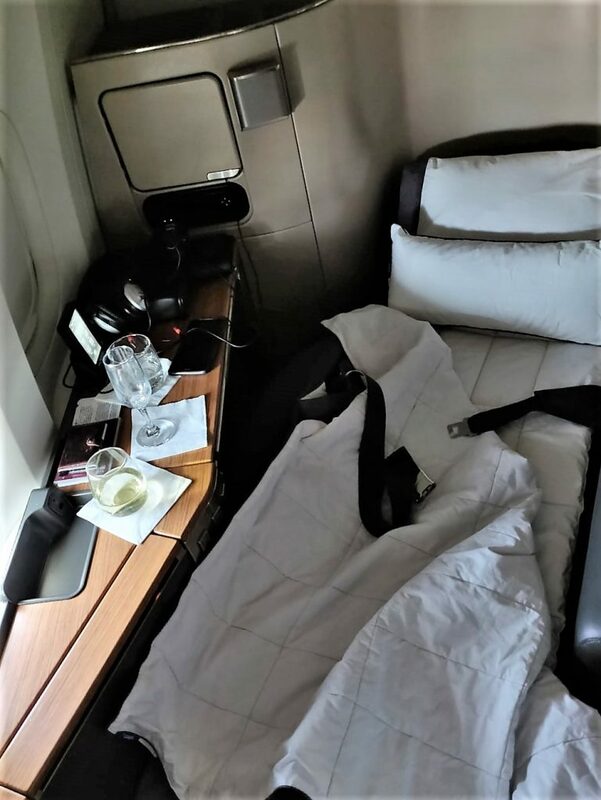 That is most definitely not first class – come on AA! I also decided to have the aromatic squash soup as well before my main course which was dressed with fresh coriander. Next came the beef cheeks which were very good. I liked the way the plates were dressed individually with garnishes such as the red chilli with the beef cheeks. I thought all the food was presented very well. It was also flavourful and filling – but again like the champagne – they ran out of choices for my friends. Yes like BA, you can preorder in business/first, but in a small cabin like this, I was still surprised. 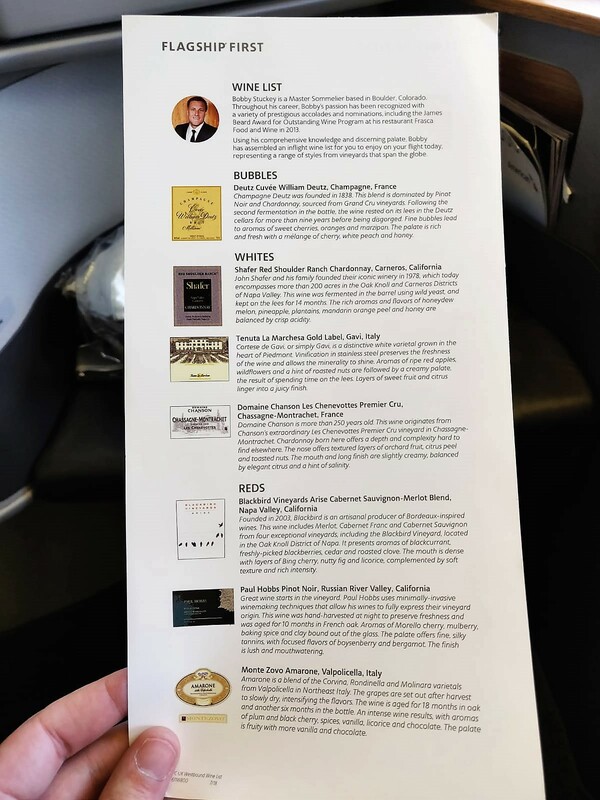 The wines were not particularly great for First class and once the Champagne ran out I decided to try some of the white wines. I tried the Chassagne-Montrachet which sounded promising but was a big let down – I must note, I am aware this is a decent wine – it’s just not to my taste at all! It could have potentially been corked. 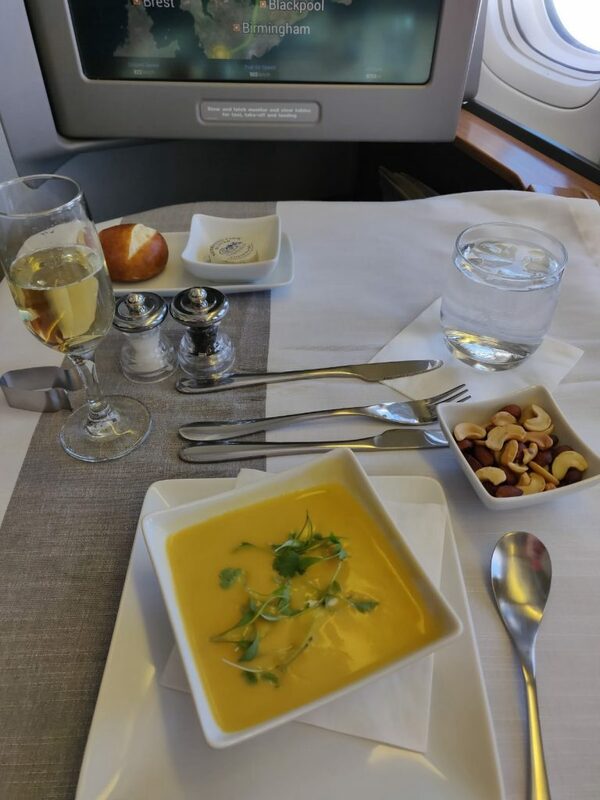 I also tried the Gavi which was better although nothing special – it also ran out very quickly long before we got to JFK. There was Wi-Fi on board the aircraft which I tried and worked well. Entertainment is something AA always seem to do well even on short-haul flights and this was no exception. There was live TV available as well as the usual comprehensive selection of recent films, TV programs, music and games. The screen wasn’t particularly large but had good definition. There was handheld touchscreen remote to operate the system. There were plenty of charging points with 2 multi-country sockets in the headphone storage compartment. Would I do it again over BA? Tricky one. As a Gold Guest list BA Executive Club member, I am “usually” looked after very well on BA, with a good level of recognition. I enjoy the crew, the interactions and generally always have a good flight. 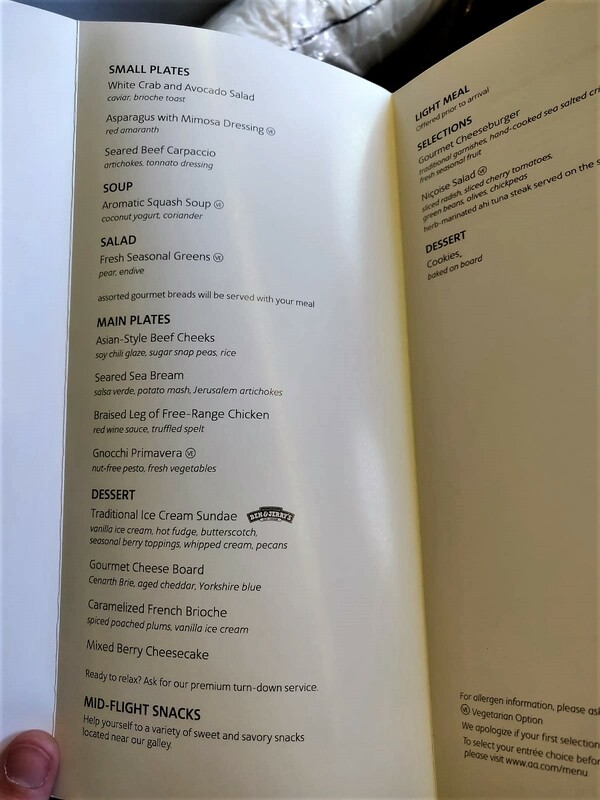 But – BA catering is still hit and miss, even in first. The “suite” is showing its age and some 747’s are still running horrible in-flight entertainment that I don’t even turn on! Does the Concorde Room beat the T3 offerings? It’s close, but I believe again that’s personal preference. 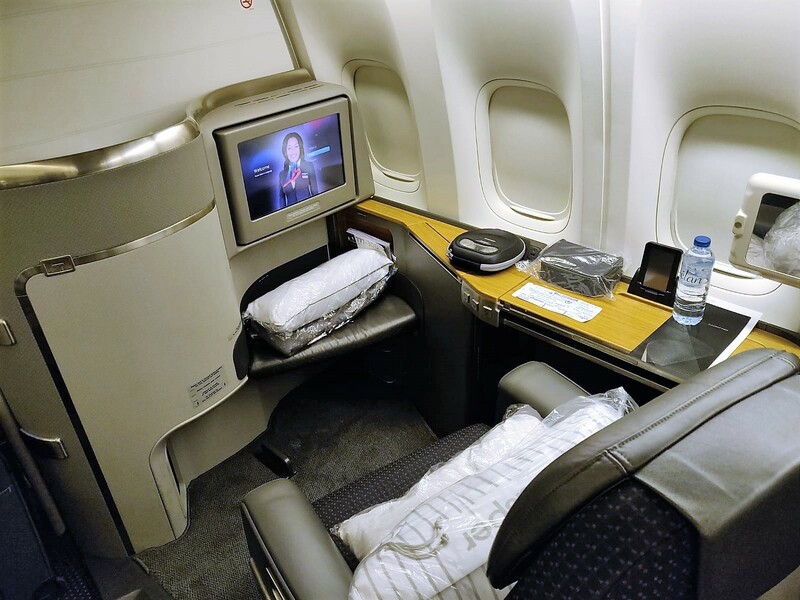 Entertainment – AA unless on a Super-Hi J (business class) B747 then BA. Ground Experience at LHR – BA – You can’t beat the First Wing. Whilst I really enjoyed my flight, AA still have some improvements to make in First. Fix the loading and the quality of drinks. Smarten up the IFE and give me champagne in a real flute before departure and this conclusion might be different. Questions? Please feel free to post a comment below and I’ll answer where I can. 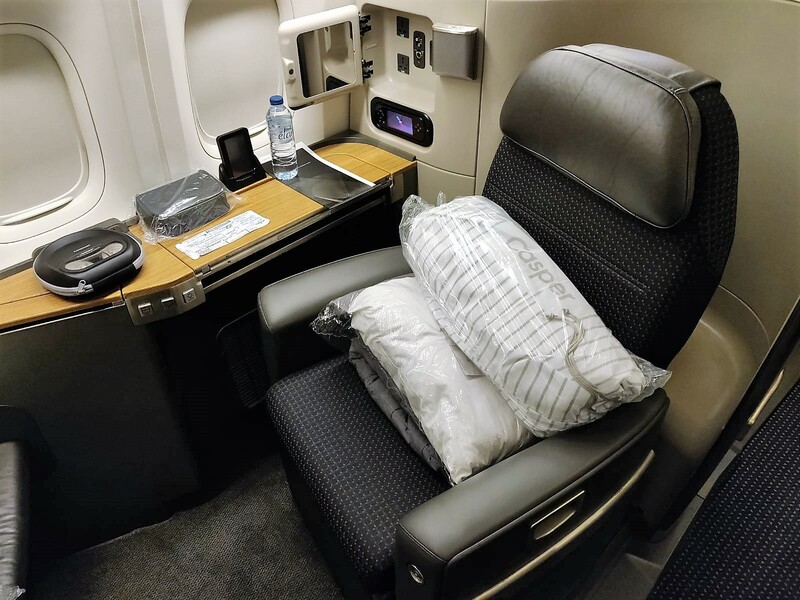 20 Comments on "American Airlines International First Class B777-300ER Heathrow to JFK review"
I’m more interested in how you booked the ticket at that price ? ! Ticket was booked in a specific AA sale that upgraded into First for £200 more than business. More details will follow about booking fares like these. Thanks for enjoying it! Casper pillows, god BA have some catching up to do! Indeed Tilly! And very comfortable it was! Sorry, forgot to add great first post review Paul and hope to see more from you in the future. A Q, in your opinion or experience as a Gold lister, what would you say was the make up of people who frequent the first lounges / Concorde room? Would you say they are mostly fare paying or a large percentage TP runners? Higher percentage of F tickets as there are only around 500CCR card holders worldwide. And thanks! 2 bottles of champagne for the whole cabin is extremely poor show for an F product! I don’t think F is worth it on the 77W with AA as they have a great J product. On BA though F is most definitely worth it over their rubbish J. Agree AA J is great and yes more fizz would have been appreciated! Tilly I’ve been in the Concorde room quite a few times (Paying) and I thought the same question. Imho it is a mix, as you would expect. Excellent review Paul, I would be very interested to know how you go about pricing out a ticket like that and how you know how to start the trip in Lisbon and end in Athens? To follow! ITA matrix is helpful in situations like this and guides are coming! How many lifetime golders are there out there? Sadly that info isn’t in the public domain but I would guess low compared to the number of gold’s. Researching today TP runs Lon to EU routes,when searching on BA it asks you to confirm low,lowest or flexible tickets with flex providing full tier points. Flex tickets a lot more expensive? Is flex tickets what you have to select for full TP’s or are lowest prices stillproviding you all the TP’s? TPs only vary on economy and PEY tickets. Business and first is fixed no matter how flex the ticket is. Avios earnings however do vary. One of the best trip reports I have seen – keep them coming! Hi Adele. Glad you have enjoyed Paul’s writing. Hopefully there will be lots more reviews to follow.